Independence Day is a good time to reflect on the role of Latin in the founding of the United States. Most of the Founding Fathers, including the polymath Thomas Jefferson, were educated men who were proficient in Latin, read classical history, and were influenced by the Roman Republic as they envisioned a new nation. The Great Seal, adopted in the early years of the United States, incorporates three mottoes, all Latin and all derived from works written by, or traditionally attributed to, the Roman poet Virgil. One is well-known and grammatically straightforward: “E pluribus unum” (“Out of many, one”), which appeared in a poem no longer attributed to Virgil. 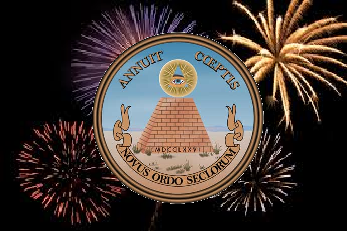 Another is mostly straightforward: “Novus ordo seclorum” (“A new order of the ages”), with the caveat that the genitive plural seclorum was a common shortening of the more standard seculorum or saeculorum. That shortening was already present in the line from Virgil’s fourth Eclogue that inspired the motto: “Magnus ab integro saeclorum nascitur ordo” (“The great order of the ages is born anew”), nascitur being a deponent verb in the present tense. The third motto, however, warrants some grammatical commentary. “Annuit coeptis” is usually translated as “He [God] has favored our undertakings,” the translation found on websites of federal agencies such as the U.S. Department of State. This motto is derived from line 625 in Book IX of Virgil’s Aeneid: “Iuppiter omnipotens, audacibus adnue coeptis” (“Omnipotent Jupiter, favor [my] bold undertakings”), the start of a prayer by Aeneas’s son Ascanius. Neither annuit nor coeptis is a familiar word with an obvious English cognate, so let’s consider them separately. Annuit has no connection to the common Latin word annus meaning “year.” Annuere means “to nod toward,” or by extension to express approval toward something by means of a nod; it’s a contraction of the directional prefix ad- (meaning “toward”) and nuere (meaning “to nod”: principal parts nuo, nuere, nui, nutus), with the “d” in ad altering to match the consonant that follows it, though this alteration was not present in the line from Virgil. Only in its fourth prinicipal part does nuere reveal an English cognate: “nutation,” the slight wobbling or nodding of the axis of a planet or a spinning top as it both rotates and precesses. Even this, of course, is far from an everyday word. One quirk of the verb annuere is that its third person singular form is identical in the present and perfect tenses, so annuit from the motto can be interpreted with equal validity as “He/she/it indicates favor” or “He/she/it indicated favor.” In my opinion, the Founding Fathers didn’t mean to imply that God’s favor was a thing of the past, but rather an ongoing divine endorsement, so with all due respect to the State Department, perhaps a better translation might be “He [God] favors our undertakings.” There’s no noun for the subject (it’s not “Deus annuit coeptis“), but from context, it seems clear that God was the intended subject. What about coeptis? Coeptum is a Latin second declension neuter noun meaning “undertaking” and is usually used in the plural; it derives from the fourth principal part of the verb coepere (coepio, coepere, coepi, coeptus) meaning “to begin.” A Latin student might therefore expect to see this noun in the accusative case in the motto, as *annuit coepta. But coeptis as seen in the motto must be either dative plural or ablative plural, so a slightly more advanced student might plausibly theorize that this is the ablative of means: “He displays favor through our undertakings,” suggesting that the Founding Fathers were the agents of God’s favor. The true explanation, however, is that annuere (like adesse or instare) is an intransitive verb that happens to take the dative, so annuit coeptis features the dative plural. So celebrate today’s holiday by watching fireworks (ignes artificiosi) and eating a hot dog (pastillum botello fartum—a Vatican coinage, in which fartum means “stuffed” from the verb farcio, farcire, farsi, fartus), but also take some time to reflect on the impact that Rome and Latin had on the founding of the United States.